Second Empire-style architecture became popular in France between about 1865 and 1880; hence its name. It evolved from Seventeenth Century Renaissance architecture and then its popularity quickly spread to England and the United States. Perhaps the most distinctive features of this style are the steeply pitched mansard roofs. The buildings tend to be very elaborately decorated on all surfaces. Often there are modest towers or rather flat domes on Second Empire buildings. Quite a few of the surviving homes in the Brush Park neighborhood of downtown Detroit illustrate Second Empire styling as interpreted by the city’s accomplished architects in the late Nineteenth Century. The Bissell home merits its inclusion on the Michigan Historic Register because of the very lucid way in which it illustrates the Second Empire style as applied to home built in an emerging Michigan industrial city. This is a symmetric-massed, two-story brick home with a slate mansard roof. You see the pedimented dormers above the dentiled corniceline while a bracketed cornice separates the first story from the second. There is a one-story bay window and a small octagonal tower. The one-story partial wrap-around porch with its fluted Ionic columns was added about a decade after the home was completed by its second owner. Edward Bissell came to Milford in the 1870s and practiced law. At this time, a variety of small but then increasingly larger and more prosperous manufacturing firms capitalized upon the water power available from the Huron River and the transportation provided by the railroad that arrived in 1871. Apparently, Mr. Bissell invested in several of these manufacturing companies, including the Milford Doorknob firm. He served four terms as Village Clerk and two terms as Circuit Court Commissioner. By 1880, he had the resources to build the elegant home you see pictured here. In 1898, Mr. Bissell sold the home to Lyman Cate who made his money in the produce business. Mr. Cate added the impressive porch that still graces the home. Over the decades, the home fell into disrepair. The owners, in the 1960s, proposed razing the home and using the space for a gasoline station. The Milford Village Council objected. In 1968, the residence was sold to Mr. and Mrs. Robert Craigie who, over the years, restored the home to its original glory. I do not know the name of the architect. Apparently, he designed a very similar Second Empire-style home for Richard C. Burtis, a Watrousville, Michigan land owner and shoe maker. 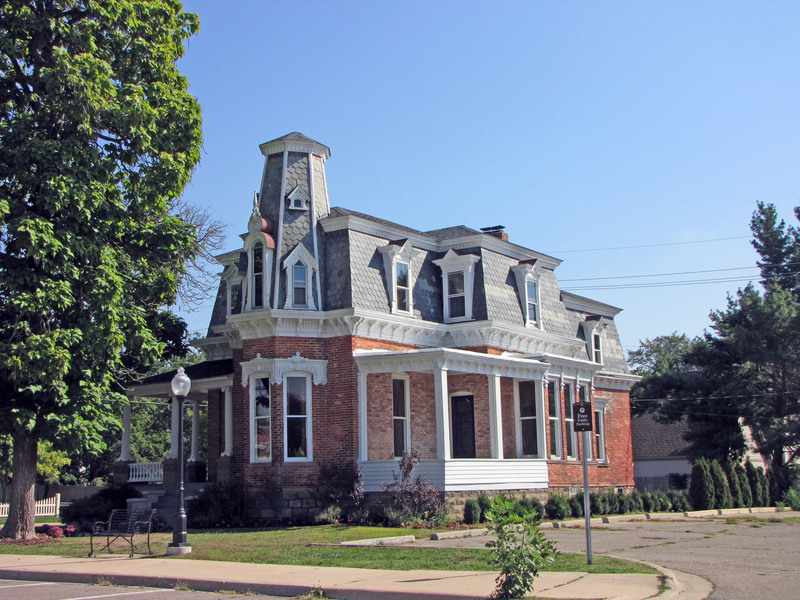 That home, completed in 1880, is located at 2163 South Ringle Road in Watrousville and is listed on both the Michigan and the National Registers of Historic Places.